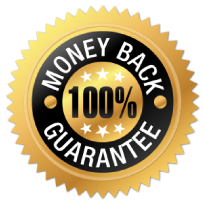 A premium herbal natural hair care formulation harnessing the hair revitalising essence of 7 ancient Oriental beauty secrets is finally in your reach. 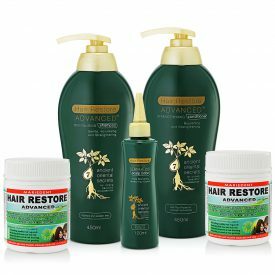 Hair Restore Advanced™ Revitalising Shampoo and Strengthening Conditioner formulations are unique combinations of treasured Oriental herbs that have been used for centuries in Traditional Chinese and Ayurvedic medicine to help revitalise the appearance of your hair and prevent hair loss. 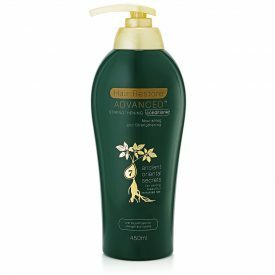 The Hair Restore Advanced™ Revitalising Shampoo gently cleanses away impurities while nourishing, revitalising and strengthening your hair deeply from the scalp to the hair tip – Leaving your hair stronger, cleaner and healthier looking. Following cleansing with the shampoo for hair growth, the Hair Restore Advanced™ Strengthening Conditioner should be used to maintain strength, volume and shine whilst locking in the moisture, giving your hair the silky soft feeling. Not only does the shampoo and conditioner formulations contain Oriental herbs renowned to revitalise the hair, they are also infused with rice protein (a highly popular Japanese Oriental beauty secret) which helps to strengthen your hair and give it more volume, lift and bounce. Considered as one of the strongest blood tonics in Traditional Chinese Medicine, Polygonum multiforum root is the main ingredient in many tonic formulas. This herb can help in the treatment of a variety of health conditions associated with aging. Medicinal uses of Polygonum multilforum root can be dated back to 730AD. Today, Polygonum multiflorum root is a common herb prescribed to patients suffering from hair loss or premature greying hair. The hair growth stimulating activity of this herb has been attributed to its high antioxidant and dihydrotestosterone lowering activity. 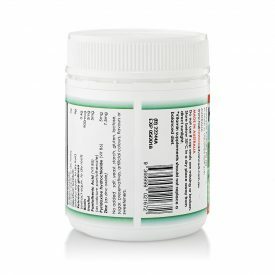 An ancient famous Ayurvedic herb, Eclipta alba (Bhringraj) is commonly used to treat multiple ailments under the five-thousand year old holistic health system. Eclipta alba is considered to have soothing properties and is known as one of the best herbs to help reduce hair loss and promote hair growth. The Sanskrit name for Eclipa alba, Bhringraj, is literally translated to “King of Hair”. Camellia oil, also known as Tea seed oil or Tsubaki oil, is an ancient Japanese beauty secret. It is a member of Theaceae tea family and is rich in Vitamin A, B, E, monounsaturated fats, antioxidants, and plant collagen. The oil is non-greasy in nature and revitalises the skin, hair and nails. Gentle enough to use on sensitive skin, it also provides protection from UV rays. 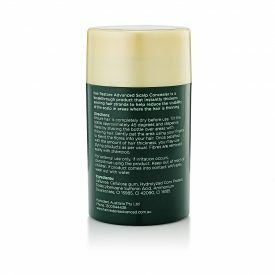 The high concentration of oleic acid in the oil protects, conditions and provides shine to hair with similar effect to silicone based hair serums. The camellia oil nourishes and softens hair while rejuvenating damaged hair. It is absorbed quickly into skin, hair, and nails, without leaving the oily residue feeling. The white mulberry or Morus alba root bark is a member of themoraceae family. The bark of mulberry root is harvested in winter and the yellowish brown outer bark is scraped off after digging up and cleaning the root. The root is then beaten with mallet to separate it from the inner bark and then dried in the sun. The Mulberry tree root bark is commonly used to reduce hair loss and strengthen hair in Traditional Chinese and Ayurvedic medicine. Platycadus orientalis leaf which is also referred to as the leaf of the biota tree has gained much interests in recent scientific studies for its hair growth stimulation properties. Also referred to as the Chinese Arborvitae tree, the biota tree is known for longevity and evergreen nature to survive in the cold dry climate of Northwest China. It is said that some of the larger biota trees planted around ancient Buddhist temples in China are more than 1,000 years old. Many modern textbooks quote the use of the biota tree to help in the treatment of hair loss. In her textbook Prescription for Herbal Healing nutritionist Phyllis Balch describes how using both the leaves and seeds of the biota tree in topical treatments help to thicken hair and promote new hair growth. It is an ancient herb known to promote longevity and health. The traditional use of ginseng in treating hair loss is well documented. Recent scientific studies in Korea and Japan show that Ginseng can reduce hair loss by converting hair follicles from resting phase (telogen) to growth phase (anagen). It also inhibits the 5-alpha reductase enzyme which plays an important role in production of dihydrotestosterone, a key hormone in androgenetic alopecia. Rice is one of the most common ingredients in beauty and diet regimens of people in East Asia. 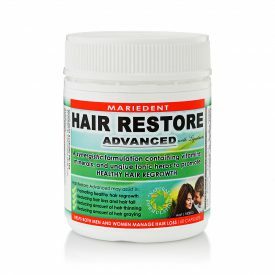 The rice protein used within the Hair Restore AdvancedTM formulations are derived from a unique process that isolates the protein from the carbohydrate portion of rice. Rice protein, a renowned Japanese Oriental beauty secret, protects hair from wind, dry air, and sun. 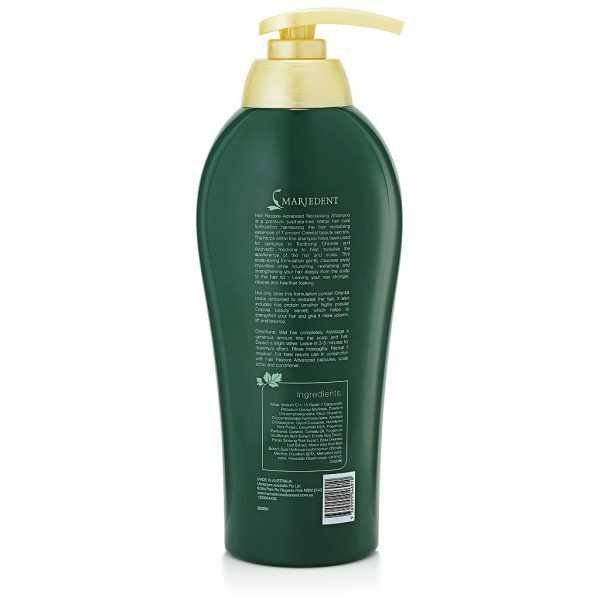 It strengthens the hair to withstand the common problems of split ends, breaking, and hair fall. 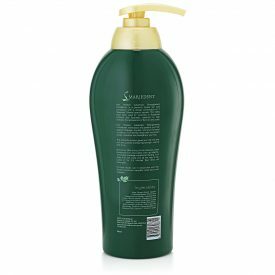 The small molecular size of rice protein enables it to penetrate the hair and expand the hair shaft diameter giving your hair more thickness, bounce and volume. For shampoo, wet hair completely. Massage a generous amount into the scalp and hair. Expect a slight lather. Leave in for 3- 5 minutes for maximum effect. Rinse thoroughly. Repeat if required. For conditioner, after rinsing off shampoo, place conditioner into your palms and rub together. 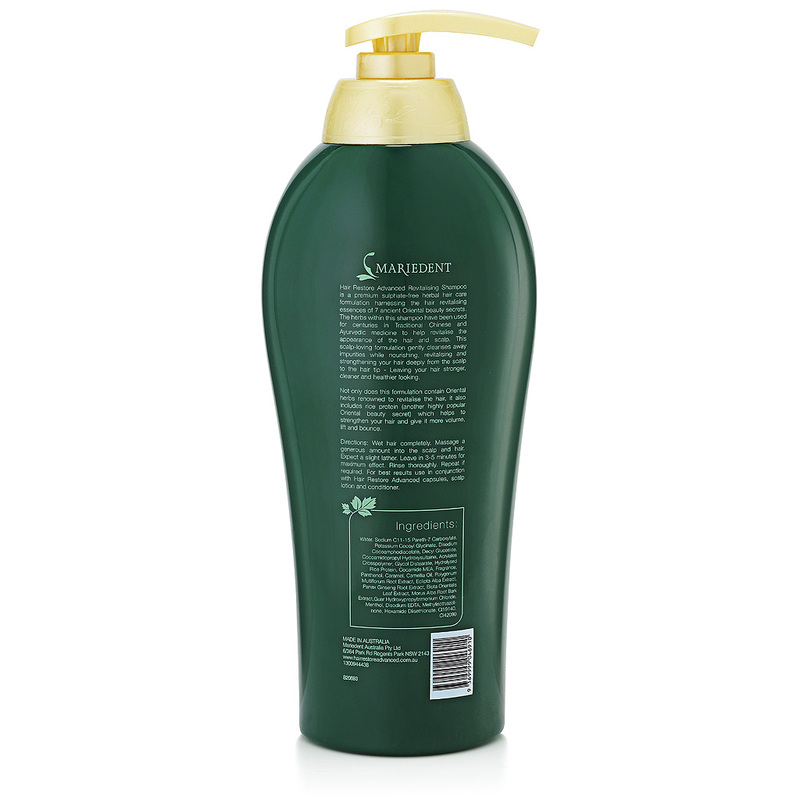 Thoroughly massage conditioner starting 1 cm away from the scalp and all the way to hair tip. Leave in for 3- 5 minutes then rinse out thoroughly. 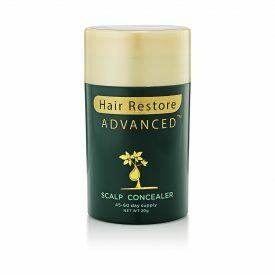 For best results use in conjunction with Hair Restore Advanced capsules and scalp lotion. Park S, Shin WS, Ho J. Fructus panax ginseng extract promotes hair regeneration in C57BL/6 mice. J Ethnopharmacol. 2011 Sep 21.